Cresswind Myrtle Beach is a community in Myrtle Beach, South Carolina which has been designed to make the most of its beautiful surroundings. This nature-inspired community of 400 single-family homes is set amidst picturesque streetscapes, manicured landscaping, meandering walking trails and lush pocket parks. Cresswind has been specially designed by Kolter Homes to foster a friendly, energetic lifestyle in the great outdoors. With an average temperature of 74 degrees, Myrtle Beach's moderate year-round climate allows residents to freely pursue their favorite activities. Cresswind residents enjoy a stunning clubhouse with many resort-style amenities. The Club is a 12,500 square-foot amenity center filled with numerous facilities to stay physically fit and socially active. Two multi-purpose rooms are the perfect location to attend a holiday party or host a club meeting. Additionally, residents can learn new recipes in the demonstration kitchen or new skills in the computer room. Cresswind at Myrtle Beach's clubhouse also includes a fabulous fitness center equipped with modern cardiovascular and weight-training machines. Those looking for group exercises can join a Yoga class in the aerobics and dance studio. Residents looking to expand their creative minds can also use the arts and crafts studio to learn out to paint or quilt. As part of Cresswind's outdoor lifestyle, the clubhouse also provides outdoor amenities to include a pool, pickleball, tennis courts, bocce ball, walking paths and a grilling area. You will often find residents socializing over a game of horseshoes or enjoying live music at the outdoor amphitheater and event lawn. At Cresswind, Kolter Homes offers nine unique home plans, each with an impressive range of customizable designer choices. Thoughtful features include kitchens with hardwood flooring, granite counters and birch cabinets, covered lanais and master baths with over-sized custom tiled showers and raised vanities. 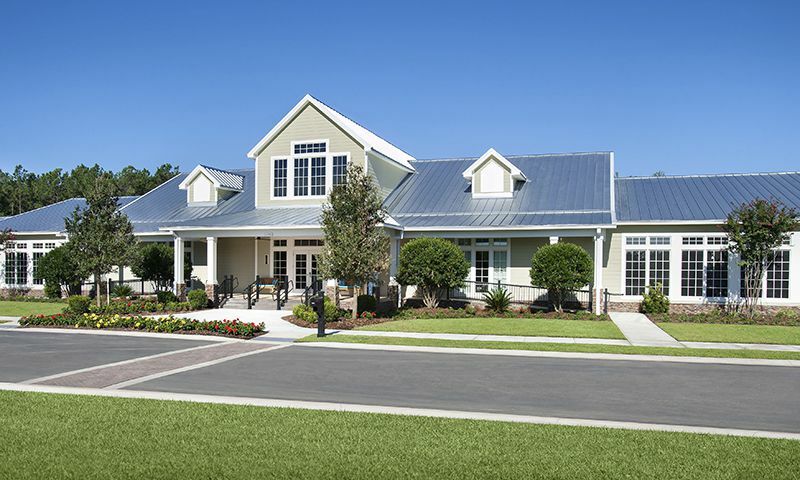 The Sawgrass Collection provides single-family homes in five different models. All homes offer at least two bedrooms with two bathrooms and attached two-car garages. These homes have open floor plans offered between 1,454 and 1,957 square feet. The Tidewater Collection offers single-family homes in four different models. These floor plans range in size from 2,136 to 2,547 square feet and all have at least two bedrooms with screened lanai rooms and optional dens. Cresswind in Myrtle Beach, SC is a community targeted to the needs and wants of today's active adult homebuyers. A professionally managed homeowners' association (HOA) keeps a calendar full of activities. Sports-related activities and clubs include golf, fishing, Yoga, pickleball, water areobics, and more. Residents can continue their education by attending cooking demonstration or give back to their community with food drives. Socializing and getting to know neighbors is a breeze with fun activities like happy hours, movie nights, and card games are planned on a weekly basis. Myrtle Beach is a renowned shore and golf resort destination with a growing retirement community of more than 300,000 people. There is always something to do for active adults in Myrtle Beach - from golf to fishing to shopping and dining at 1,800 restaurants. Cresswind is about ten minutes from the new Myrtle Beach International Airport, which features many air carriers. For additional convenience, Grand Strand Regional Medical Center, ranked #1 in South Carolina for heart surgery, is also about ten minutes away. Cresswind puts homeowners near all of the area’s best destinations. Myrtle Beach State Park is a bike ride away, while the mile-long Myrtle Beach Boardwalk and Promenade provides the perfect backdrop for a waterfront stroll. Golfers can take their pick from 33 courses within ten miles of the community. Cresswind Myrtle Beach residents can also take in award-winning shows at The Calvin Gilmore Theater and The Carolina Opry. For outdoor dining with picturesque water views, folks head to Murrells Inlet Marsh Walk to savor the cuisine of the “Seafood Capitol of South Carolina.” A mere 200 yards away from Cresswind is Market Common, a community hotspot featuring an excellent selection of shopping, dining and entertainment. Cresswind is a wonderful community of new homes with an envious lineup of amenities and vibrant lifestyle for buyers looking to find a new home in Myrtle Beach, South Carolina. The Club - 12,500 Sq. Ft. There are plenty of activities available in Cresswind Myrtle Beach. Here is a sample of some of the clubs, activities and classes offered here. The Sawgrass Collection provides single-family homes in five different models. All homes offer at least two bedrooms with two bathrooms and an attached two-car garage. These homes have open floor plans. The Tidewater Collection offers single-family homes in four different models. These floor plans all have at least two bedrooms with screened lanai rooms and optional dens. 55places.com is not affiliated with the developer(s) or homeowners association of Cresswind Myrtle Beach. The information you submit is distributed to a 55places.com Partner Agent, who is a licensed real estate agent. The information regarding Cresswind Myrtle Beach has not been verified or approved by the developer or homeowners association. Please verify all information prior to purchasing. 55places.com is not responsible for any errors regarding the information displayed on this website.